Did you hear about our surprise celebrity visit? Ever had the chance to meet someone famous? Someone you really admire? For some that might be a movie star, others, a musician. I have a few artists and authors I'd love the chance to chat with. Still others dream of meeting athletes. We are naturally drawn to those who inspire us, those who bring us joy and push us to be better, learn more, reach higher. That's why us quilter's feel a little star struck when we get to meet one of our favorite makers. You can imagine our excitement when none other than THE Jenny Doan of Missouri Star Quilt Co. walked through our door unexpectedly! 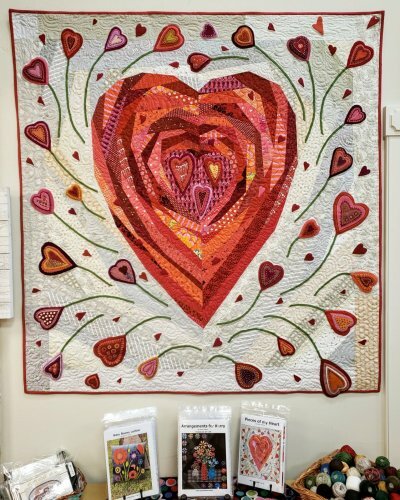 Her designs and web tutorials have drawn countless first time quilters to the art. Many of our customers have mentioned her influence as they have made their way along their own quilt journey. 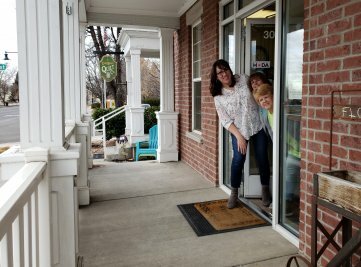 Her devotion to quilting has revitalized a whole town, turning Hamilton, Missouri into a quilter's Mecca of sorts. Last Friday, two lucky customers who had waited patiently in a long line at our register during our Open House, were rewarded when they saw Jenny Doan's smiling face at our door. There were squeals and hugs and maybe a little hyperventilating... It was truly an honor to welcome her to the shop and a delight to chat. We were so happy our friend Karen would bring her to meet us! And talk about perfect timing! 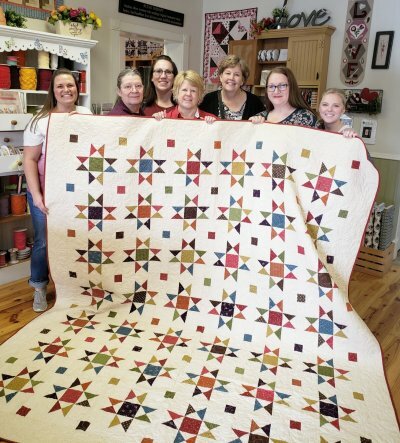 Stacey Giles had just brought in her latest finish and it happened to be Jenny's Ohio Star quilt pattern! Photo moment! Isn't it beautiful!? Of course we have kits in store! And there in the middle of us adoring fans is the one and only Jenny Doan. Choose one of two different class dates! How cute would this little Clam Up bag be paired with The Big Bag I showed you last week? Sign up online or in store now! 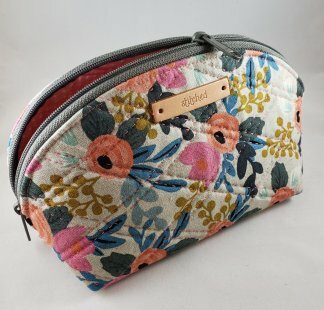 If you have been looking for a small but very functional bag for sewing, travel, or retreats you are going to like Clam Up. This pattern has five sizes from XS to XL. We will be making the XL. Double-slide zippers and handy grab tabs make the bags easy to open wide and attached side panels prevent contents from falling out. I thought it might be fun to show you two Ohio Star quilts in one newsletter. Both are new to the shop and both are beautiful. 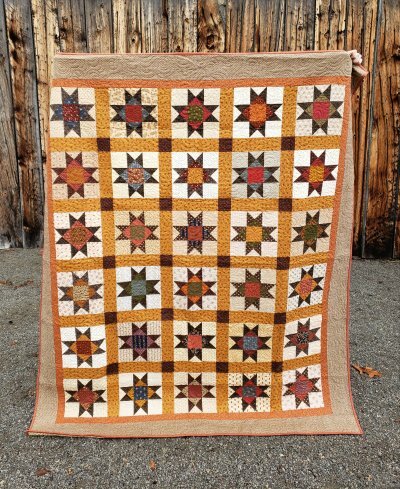 Is there anything more classic in the world of quilting than an Ohio Star block? Suzanne Adams pieced the Autumn Sky quilt (67" x 80") by Norma Whaley using a variety of Civil War reproduction prints and a lovely Diamond Textile woven border. Isn't it fun to see the change in the look of a quilt with the simple addition of contrasting sashing and border. We have kits in store! Let's end this newsletter with a whole lotta love! Marianne Michaels just finished this striking work of art designed by Wendy Williams of Flying Fish Kits. Pieces of My Heart combines bold, cotton prints and warm, hand-dyed wools, creating both visual and tactile texture. We recently received a big shipment of Wendy Williams' wonderful patterns all the way from Austrailia. Stop in and see what's new! We're still making Monday, well... Marvelous by offering a discount in one of our departments but we're adding a little extra excitement! In addition to our regular Marvelous Monday Sale we want you to stop in and find out what's on the porch! We will be giving a hint each Monday morning on our social media pages (follow us on Instagram & Facebook!) but you'll have to come in to find out what item we have on the porch at an extra deep discount! It could be a favorite notion, new book or even a whole line of fabric! So join us for Marvelous Monday on the porch! Monday, January 21st - 25% off One Cut of Fabric! Every Wednesday, 10 a.m. - 2 p.m. in our classroom. Put yourself in Time Out at the Wagon. We all need Time Out from housework, phone calls, and everyday responsibilities. Come to “Time Out at the Wagon” and do just that. Bring a project and sew the day away with friends here at the shop. Marsha is looking forward to being in Time Out and hopes lots of you will join her.